Inflatable boat number plates are manufactured with a second decal space for the annual mussel fee. If you have an exemption not requiring a second decal, please let us know at the time of order. Visit any West Marine Store, catalog or online. Visit the Defender Industries Store or online. PURCHASE: a pre-paid code package directly at your local Marine Center, Inflatable Boat dealer or online.. One package is good for a Port and Stbd set. Please click "Retail Locations" button. REDEEM: your pre-paid code ONLINE at www.boatnumberplate.com. Inside each package is a unique user name and password you enter online. 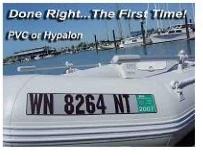 For PVC and Hypalon, you supply your registration number, background color choice (7 to choose from, Grey, White, Red, Blue, Yellow, Orange or Tan), choose either PVC or Hypalon boat material and shipping information. *Some colors may not be available in certain countries. All registration lettering is black block font. For fiberglass, wood, or PWC you supply your registration number, and lettering color (black or white). Rigid hull plates are clear and designed to contrast against your hull color. Boat Number Plate Approximate dimensions: 3.5" x 21". Dimensions vary based on individual state/country requirements for decal/letter size and spacing. Verify your dimensional requirements when ordering. 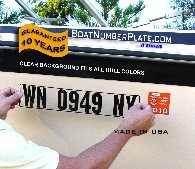 RECEIVE: in 3-5 days, your new boat number plates are custom made & then shipped directly to you. We ship anywhere in the world (except where restricted) including FPO's & PO Boxes etc... FREE SHIPPING*. The cost of your shipping is included with your purchase. Business First Class Mail for US and International ordering. US orders are usually received in 5-7 days from order date. ENJOY: your new boat number plates. They will give you a great sense of pride and meet US State & USCG and all International Government requirements. We also include an area to affix your state decal for USA or anywhere else in the world it is required (Inflatable boats only). Learn more about the number one solution to applying your registration numbers AND state decal. Don't be fooled - Boards are not legal. Look for boat number plates featured in the February 2014 Boating Magazine Weekend Workbook!